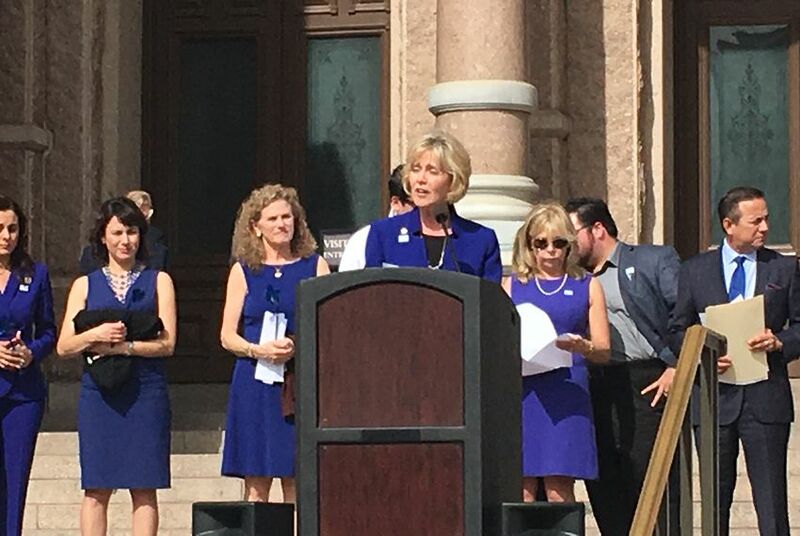 Standing in front of the Capitol in 80-degree heat, attendees gathered at a rally sponsored by Child Protection Roundtable of Texas and the Texas Home Visiting Coalition urging legislators to make long awaited changes to how the state handles abused and neglected children. About 100 people chanting “let’s get it right” on Tuesday afternoon cheered and applauded the renewed energy among legislators and advocates to finally overhaul Texas’ child welfare system. Standing in front of the Capitol in 80-degree heat, attendees gathered at a rally sponsored by Child Protection Roundtable of Texas and the Texas Home Visiting Coalition to urge legislators to make long-awaited changes to how the state handles abused and neglected children. Madeline McClure, CEO of child advocacy organization TexProtects, urged attendees to continue contacting their legislators throughout the session. She said in her past 10 legislative sessions working on improving Texas’ child welfare system, this was the most bipartisan support she had ever seen. The rally comes as state legislators endure mounting pressure to “get it right” this Legislative session on funding and overhauling Child Protective Services and the foster care program. Advocates have pointed to years of underfunding, low wages, high turnover and overworked staff as main culprits for the state’s crumbling child welfare system. Those problems have led the agency to struggle with locating and seeing endangered children within one to three days and with finding suitable foster care placements. Agency officials have also dealt with troubling headlines that children are sleeping in hotels and Child Protective Services offices due to lack of placements available. Gov. Greg Abbott said in his State of the State address last week that Child Protective Services is a “life-and-death” matter this session and warned legislators that underfunding the system again could haunt them. Legislators, facing political pressure from constituents and state leaders like Abbott, Lt. Gov. Dan Patrick and House Speaker Joe Straus, are working on fixes. Sen. Jane Nelson, R-Flower Mound, chairwoman of the Senate Finance Committee; Sen. Charles Schwertner, R-Georgetown, chairman of the Senate Finance Committee’s Workgroup on Child Protection; and Sen. Carlos Uresti, D-San Antonio, jointly filed Senate Bill 11, the main legislative vehicle for overhauling how the state cares for vulnerable children. Patrick has made the bill part of his 25-point legislative agenda. The bill is expected to be called for a vote and sent to the Senate floor later this month. Schwertner said there is more work to do and that his health committee would “work and work and work” until Child Protective Services and foster care was on the right track. “The care, protection and safety of the children of Texas should be the responsibility of each and every individual” in the Capitol and the state, Schwertner said. Under SB 11, DFPS would review and retain abuse and neglect records for longer; CPS special investigators would need to see residential child-care facilities abuse victims within three days; local CPS officials would be required to analyze agency data to look at foster care capacity needs and work with organizations; a new regional pilot program would be created for a nonprofit organization to provide case management services for children with behavioral health issues; and foster care contractors would receive more funding incentives and consequences. Rep. Cindy Burkett, R-Sunnyvale, filed House Bill 1549 “to make the most vulnerable in our population safer.” Some provisions in her bill would create a special unit in DFPS focused on child deaths; require the agency to track and report data on child deaths and near-death incidents; develop a foster family recruitment plan; and create a Prevention Advisory Board to provide recommendations to the Legislature, governor’s office and other agencies on child abuse and safety. Burkett also said she plans to file another bill soon that focuses on kinship care. "The best outcome for any child is for them to never enter the CPS system,” Burkett said. On Monday, the Senate Finance Committee scrutinized Department of Family and Protective Services budget requests while the House Workgroup on Child Protective Services floated a proposal to make the department a standalone agency. A legal filing from Texas Attorney General Ken Paxton has put Texas leaders in a delicate position of conceding problems in foster care but arguing against a federal judge's proposed reforms.